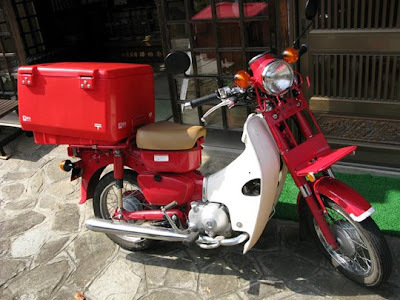 It started at the land of the rising sun at 1958 for a need for cheap low cost urban bike to zing-zang around the city. 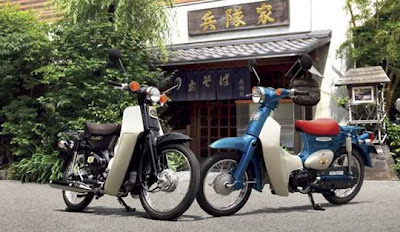 "Honda Super Cub, (originally the Honda C100 or Honda 50) also known as the Honda Cub, is a 49 cc 4-stroke motorbike first manufactured by the Honda Motor Co. Ltd. in 1958. With more than 60 million sold worldwide — the top selling motorbike of all time — the Honda 50 is still produced today, 50 years after its inception~ wikipedia.com"
The late Tan Sri Dato' Loh Boon Siew aka "Mr. Honda" quickly noticed the potential for a low cost urban bike for Bolehland and quickly meet up with Sōichirō Honda, the founder of Honda Motor Co. Ltd. and the rest was history.From there onward, Honda Super Cub finds it way to Bolehland thru a bond of trust and respect between them even thou both of them are separated by many mile apart. It was known as the "Kap chai" in the bolehland street and often you can still see nearly everyone (young and old alike) driving both the older model and newer version alongside that continue plying our road until today.Yes. It does bring out Spectre old sweat memory while driving his 1st Honda Cup to terrorize the streets, girls and neighbors. Those two bike look amazing cool!